Camden's 'Monarch' plays host to David Guez, former 'The Real Tuesday Weld' collaborator who is touring his debut solo album, An Imperfect Harmony. The project features a range of collaborators, including music and string arranger Chris Elliott (Amy Winehouse, Mark Ronson) and Art Director Lawrence Azerrad (Esperanza Spalding, Sting). 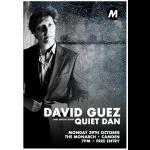 Join David to celebrate the release of his first single 'An Invisible Man' taken from the album.